According to official figures released last week, the government's new apprenticeship levy is yet to increase the number of people being trained. 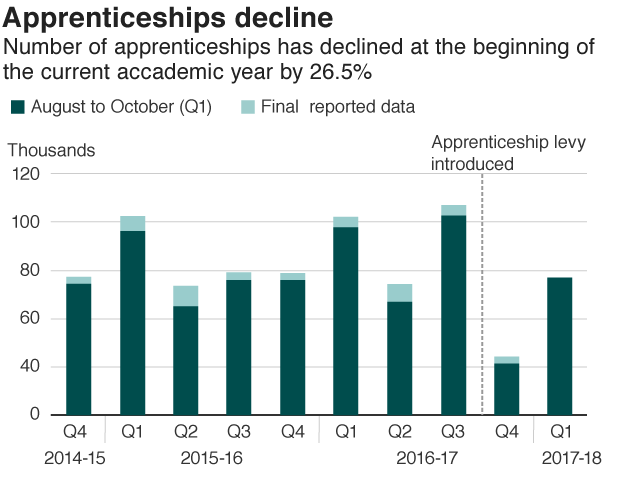 There were 114,000 apprenticeship starts reported so far for the first quarter of the 2017-18 academic year, compared with 155,600 for the same period in the previous academic year, a fall of 27%. Employers' groups said the government had failed to act on mounting concerns about changes to the apprenticeship system, and they are concerned about the cost to business of the apprenticeship levy, which was introduced in April 2017. The Department for Education said the levy and other changes was likely to have affected the number of apprenticeship starts and participation last year. The Institute of Directors said many employers were still struggling to comprehend how the system was meant to work. "Today's figures are a warning for the government, as it becomes increasingly unlikely that they will meet their three million new starters target, the levy is the right idea, but the system is ripe for reform." "It is clear the apprenticeship levy and wider reforms aren't working and need a radical rethink. Government must listen to business concerns." The 26% quarter-on-quarter fall was not as big as the 59% slide between the fourth quarter of 2015-16 and the same period in the 2016-17 academic year. "The last year has been a period of significant change. It will take time for employers to adjust. But we must not lose sight of why we introduced our reforms in the first place – to put quality at the heart of this programme, and putting control in the hands of employers. "It is right that they are taking their time to plan ahead, with two years to spend their levy funds, and maximise the opportunities an apprenticeship can bring for both the learner and employer. Feedback we've had shows employers are doing exactly that." The figures are subject to change until final data is published in November.